Bank chief sentenced to prison | Marbella Marbella – Adelante! A court in Spain has sentenced the chief executive of the country’s biggest bank, Santander, to six months in prison for making false accusations against clients 15 years ago. 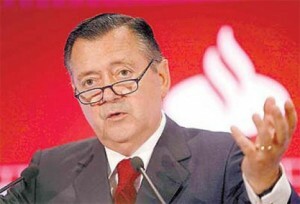 The court found Alfredo Saenz carried out the deception when he was head of Santander subsidiary Banesto. Banesto has said it will appeal the sentence. Saenz is not however expected to serve any time in prison as he has no prior convictions. He was convicted along with two others of making false accusations of fraud against four Banesto clients to force them to repay a loan of 3.6 million euros (5.2 million dollars) in 1994, shortly after Santander took over Banesto. They must also pay fines of 9,000 euros each, according to a copy of the ruling by the court in Barcelona.